Thailand is the first mission ad gentes of the MSP. In January 13, 1970, the MSP had sent its first missionary, Fr Pedro Pacuribot MSP, to the Diocese of Khorat (Nakhon Ratchasima). Five years later, Fr Filomeno Mahusay MSP joined Fr Pacuribot; he arrived in Thailand on September 8, 1975. Fr. Mahusay opened the Mary’s Help Center in 1994 at Nongbuakhok. With this development, Fr Leonilo Pacuribot MSP and Fr Alan Nelson Navales MSP joined him on June 17, 1998. At present (2010), there are three priests serving in the Southeast Asian kingdom, namely, Fr Filomeno Mahusay MSP, Fr Jose Sonny Cantillano MSP and Fr Mario John Paul Tejada MSP. They take charge of two parishes and the Mary’s Help Center which is a refuge for people afflicted with AIDS. 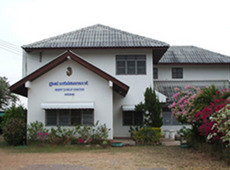 The Thailand mission remains the oldest extant MSP mission to date.